Henderson Swimming Pool Pump Run Schedules. “Fall back Spring forward” This means that all pool timer clock schedules need to be set to the correct time (an hour backwards in the fall and an hour forward in the spring). Also, all timers need to be changed to run for the winter schedule turning on at midnight and turning off at 8am. If, you have a small pool, then you could have the pump run for a reduced time ending 7am. During the summer, pumps run during the day-time. An average rule of thumb for the Las Vegas and Henderson Valley area is an hour for each 10″ increase in temperature. The main reason for it to run at night during the winter is that it can freeze here in the Henderson and Las Vegas areas. If, the pump is running during these freezing periods which is normally late evening early morning, then the pipes and equipment are less likely to crack due to being frozen. Water is less likely to freeze if it’s flowing. The solar should also be turned off with the fall time change. Double check that the levers and controls that operate the solar are turned off, preventing flow of water up onto the roof. Also ensure equipment that has automation controls for the solar, is turned off via those controls, and also via the in-house controllers (if they exist). All other non-automated solar systems are turned off by manually turning the solar levers to off. Just follow the flow direction of the water through the pipes, and you’ll be able to tell if it is in fact off or not. Even if it says on the automation controls that the solar is off, you should double check that the levers have moved to the off position as sometimes they are reversed or are not working as intended electronically. Some pool automation systems also have freeze protection options within them. Check to see that this is enabled. The normal temp for it to turn on at is 38″. Most of the new variable speed pumps also have a freeze protection option within them. This should also be checked to ensure that it’s enabled and the temps set correctly. Variable speed pumps have temp sensors within them, and it’s actually the temperature of the pump itself and not the temperature of the water within it that is measured. 1) Check that the intermatic timers are set back correctly inwards, as they can sometimes be left in an outward position. They can be fragile so don’t push them back too hard, but enough so that they are all the way back. 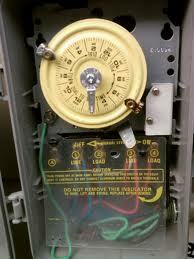 2) Check that the “On” and “Off” pins are securely tightened, so they don’t move when the clock gets to them. Use a set of pliers if needed. 3) Check that freeze protection is set to “on,” if you have this option. 4) Check that your solar heating is off, if you have one. This entry was tagged Swimming pool cleaning service, Swimming pool cleaning service Henderson, Swimming pool pump run times, Summer pool pump tun time. Bookmark the permalink.